Importance The clinical evidence base demonstrating bariatric surgery’s health benefits is much larger than it was when the National Institutes of Health last held a consensus panel in 1991. Still, it remains unclear whether ongoing studies will address critical questions about long-term complication rates and the sustainability of weight loss and comorbidity control. Objective To summarize findings from a multidisciplinary workshop convened in May 2013 by the National Institute of Diabetes and Digestive and Kidney Diseases and the National Heart, Lung, and Blood Institute. The workshop aimed to summarize the current state of knowledge of bariatric surgery, review research findings on the long-term outcomes of bariatric surgery, and establish priorities for future research directions. Evidence Review The evidence presented at the workshop was selected by the planning committee for both its quality and duration of follow-up. The data review emphasized randomized clinical trials and large observational studies with long-term follow-up, with or without a control group. Findings Several small randomized clinical trials showed greater weight loss and type 2 diabetes mellitus remission compared with nonsurgical treatments within the first 2 years of follow-up after bariatric surgery. Large, long-term observational studies have shown durable (>5 years) weight loss, diabetes, and lipid improvements with bariatric surgery. Still unclear are predictors of outcomes, long-term complications, long-term survival, microvascular and macrovascular events, mental health outcomes, and costs. The studies needed to address these knowledge gaps would be expensive and logistically difficult to perform. 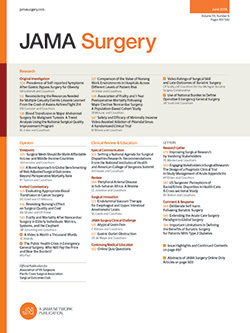 Conclusions and Relevance High-quality evidence shows that bariatric surgical procedures result in greater weight loss than nonsurgical treatments and are more effective at inducing initial type 2 diabetes mellitus remission in obese patients. More information is needed about the long-term durability of comorbidity control and complications after bariatric procedures and this evidence will most likely come from carefully designed observational studies.